Two Cancers together are very protective and caring people. Because they share the same qualities, both their strengths and weaknesses are highlighted in the relationships they share! Sentimentality runs high in their partnership and they are very nurturing in all aspects of life. But both being moody can sometimes hurt the other one unintentionally. Cancer people are very courageous and money minded people. They live in their sensations, emotions, and imaginations. Cancers’ love for the chivalrous and noble grace makes them happy. Cancer are very intelligent and cautious regarding every matter of personal and professional life. They are highly valued by people for their subtle and compassionate nature. They never harm anyone intentionally and are themselves cautious enough to keep away from all kinds of harms. Cancer people are true ones who never endorse hypocrisy. They are so determined people with the capability to work even in worst of conditions and they get appreciable results. Cancer persons like to recall the things of past that had a lasting impression on their minds. They like to remember things which hold a lot of sad memories of their life and thus also have a much wounded part of their heart which bleeds time to time. Two Cancer together are a treat for each other because this is where they can share everything without the fear of getting misunderstood. Only a Cancer can find the right words and manner to calm another Cancer. It takes one Cancer to console another Cancer as they are well acquainted with each other’s characteristics. They share a great bond despite having quarrels about petty things. They can react sympathetically towards each other’s problems. They are sympathetic about their common woes and discuss potential solutions that might benefit both but only when each is wise enough to see in the other his or her own mistakes, thus correcting, instead of compounding them. At times these two need some kind of support from other friends so that their intricate persona could be balanced deftly. In the eyes of the society, the Cancers are usually considered as financially stable, but Cancers are never satisfied when it comes to matters related to money because they are always paralyzed by the fear that what will happen to them if they do not save the right amount of money for the future. Cancers together in any relationship are always economical in money matters and like to donate money to charities, but still people have the notion that they are very greedy. They are obsessed about secrecy and are afraid of people prying. But they are lovable for each other as well as of others. Their sense of humor makes them the cynosure in most of the gatherings. At times, Cancer people become quite unconventional, but they are wholeheartedly appreciated for their great sense care and love for everyone. Cancers display a wide gamut of emotions within a short span of time which is welcome and accepted by both of them as they have this in common. 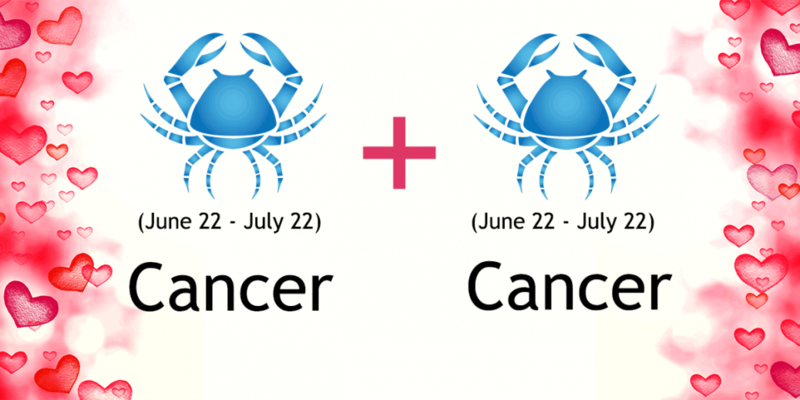 When two Cancers share any relationship together it has two basic factors, first it is a highly emotional one and secondly, stability plays a very important role in their lives, individually and together as well. Whether, they are colleagues, siblings, friends or relatives they always have a very loving relationship which is full of care and respect of each other. They are always ready to help each other and take a stand for each other in all times, good or bad. As business partners, two Cancers can create miracles as they both are very determined and hard working with appropriate sense of money. But sometimes their over cautious nature can stop them from taking a few risks which in long term could prove healthy for their business. As for couples, they make an excellent couple with all the qualities of love and loyalty but they have to keep a check on their insecurities and mood swings. Parents and children who are Cancer again share an excellent relationship as Cancer parents are always very nurturing and Cancer children are most obedient and parents oriented kids. All in all, Cancers usually share all the relations in a lovely manner. Generally the two Cancer people make a smooth relationship but difficulties pop up when they are in a melancholy mood or are going through some rough phase of insecurities. Cancers end up being too sensitive because they feel that they do not receive adequate amount of emotional security and hence the fear of rejection always lurks in their minds. Such things cause arguments and tears in their relationship. Cancer worries about things that have the maximum probability of causing imbalance in their lives and hence they never feel comfortable with the present. They just need to be a little more confident about themselves and their relationship. Then they can be amazingly strong, forceful and tough, until their feelings are hurt again and back they crawl into the protective shell. Also the cautious nature of the Cancers can prove to be helpful sometimes because all their fear do not stem from imagination. I’ve been in a number of empty relationships..and a few good ones, but always felt like something was missing. I’d never even considered dating a Cancer, thinking that I’m emotional enough for the both of us, and the balance of a different sign would possibly be most profitable. However, I’ve recently run into an old high school interest. I was in a relationship then, but the attraction between us was so strong, our teacher had even made a suggestion that we consider each other as a great fit. I blew it off, but never forgot how good it felt to secretly like him. Years later, we run into each other. We exchanged phone numbers, and a few days later we had a 5 hours phone session. During the course of our conversation, we realized how much we have in common. Our feelings, our thoughts, our desires, and amazingly, even our fantasies. It all sounded too good to be true, until we realized, WE’RE BOTH CANCERS. The bond between us ALREADY is out of this world strong. I sooo look forward to finding out where out goes from here! Saggitarius men are abusive… My father is a Saggitarius and he’s beaten on my mom a couple of times. I’m glad you got out of that relationship nattie. @Nattie Did you ever find your closure?? Only once have I dated another Cancer. (I am a woman) he was cautious to the point of frigid coldness towards me and my often unstable emotions. Although this was the strongest chemistry I have ever felt with anyone, the relationship lasted but 3 months because he never shared what he was feeling with me so I broke it off. I then proceeded to write a loooong emotion filled hate email about how he would regret his decision for allowing me to leave (so stupid of me! )I contacted him a while after (he lived about 3 hrs away from me) and asked if I could come see him. I was hopeful he’d finally open up telling me that he misses me dearly and we’d live happily ever after. At first he was apprehensive but finally agreed. Once I got there he was once again very cold showing very little emotion didn’t care to ask me if I was thirsty. I poured out my heart to him and he told me he didn’t feel the same! 3 years later I still think “what if”. Now I’m sitting here with a 1 year old from a recently failed abusive relationship with a Sagittarius in deep regret. I wish I could go back in time or at least contact him but once when I tried, same cold exterior displaying no interest whatsoever. What should I do? I feel like I still need closure!